I love running on trails for myriad reasons. It's a great way to improve running economy and stability because of the uneven ground. It's the perfect place for "get in shape" low zone training because your pace isn't on display for all to see. 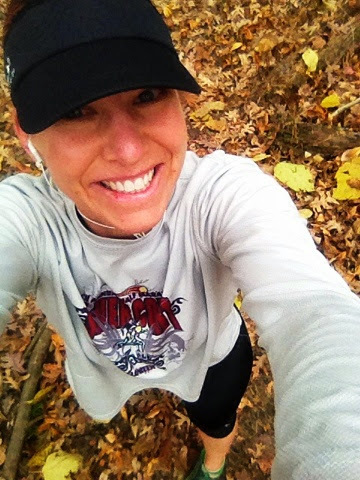 Oftentimes when I'm dreading a run, I can get myself out the door just by heading to the woods instead of the roads! However, the woods and single track running trails are by definition isolated and present some inherent dangers. The best thing to do is find someone to run the trails with you! There are a lot of running groups out there and you can find a good running buddy. When I moved to Va I was lucky enough to find the Moms run this Town group. We have regular meet ups where you can get to know other folks in the group. When you want to head out to the trails you can post on the board to find a running buddy for the day! You can also check out groups through your local running store. Always meet people in a public setting before making plans to run the trails with them!! I used to leave notes for my hubby, but now I take a pic of myself (so he will have information regarding what I'm wearing) and text him the photo with run information, where I'm running, how long, projected paces, etc. Even if you have a running buddy let someone know where you are... Your spouse, kids, roommate or even another running buddy. If you don't live with that person, or don't plan to see them after your run, always remember to check in with them, so that they know you made it home safely. If you don't have fine friends set up someone can track you with "find my phone" or something similar for non-iPhones. They also have tracking devices like "spot". And I want to try out a tracker device that I've seen on Facebook (TrackR - http://www.thetrackr.com/) to see if it could work to keep track of me while I'm out running. Plus - If you have your phone with you and you bonk or get injured you can make a call and have someone pick you up! Road ID's app with eCrumbs is also a good one to help track people on the run. When I run in the dark, I use the RoadID app to let my husband know when I've started the run. It sends out alerts if I stop running for a certain period of time; it first asks if I've stopped for something. If I dont respond, it sends out an alert.